Cooking with almond flour may pose a slight challenge for those who are new to a gluten-free lifestyle. Learning to prepare meals using gluten-free alternatives involves an understanding of the unique cooking properties of foods. Also, there is a significant difference between cooking and baking, the latter being the more nuanced of the two. It is not a grain-based flour and therefore does not possess the carbohydrate content of its competitors. Almonds are a tree nut and high in proteins and natural fats. They are low on the glycemic index, which is why almond flour may help combat obesity whilst being a first choice for diabetics. The fats contained in almond flour are unsaturated and essential for the human body; this means that your system actually needs this quality of fat. Unless you are on a severe fat-restrictive diet, almond flour can be a guilt-free gourmet fundamental in your kitchen. The first thing a chef who is new to the almond experience needs to know about this nut flour is that it can come in many forms. Almond flour is different from almond meal, as the latter is a more coarsely ground product. Under the umbrella of almond flour there is a difference between the traditional variety and the blanched. You will find that blanched almond flour is a far more tenable product in the kitchen, especially where baking is concerned. Blanched almond flour removes the fibrous hulls of the nuts, leaving a light and fluffy flour product that makes for softer baked goods. Though traditional wheat flours can be stored in airtight containers for lengthy periods of time, almond flour is different in this respect. Much like quinoa and soy flours, almond flour needs to be refrigerated and kept from light. This is because almonds contain a high content of delicate monounsaturated fats that are threatened by exposure to both light and air. These elements speed up the rate at which almond flour becomes rancid, so proper storage protocol is necessary in order to keep your product fresh. If you find you have a large amount of almond flour left over post your last baking effort, freeze it to protect its freshness. 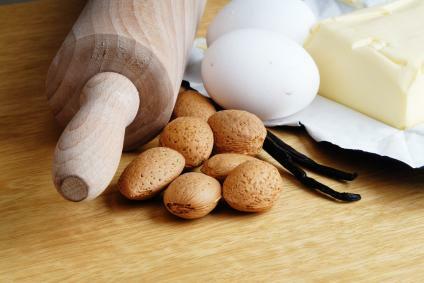 When cooking with almond flour, it is truly the fat content that influences your dishes and baked goods. The fat in almond flour helps replace the soft elastic qualities of wheat gluten. Though almond flour cannot precisely replicate the texture of glutinous wheat flours, it will provide your foods with more moisture than a light dry product such as white rice flour. The moist qualities of almond flour are one of the major perks of using a tree nut-based flour. Keep in mind that coconut flour, which is not of the tree-nut variety, actually produces opposite results in that you may have to add supplemental water back into your recipes when using it. Keep in mind that almond flour produces very dense, rich baked goods. So your recipes for crispy, thin cookies won't work as well with almond flour, but your recipe for chocolate cake will. Because of its fat content, you can eliminate things like dairy or eggs from your recipes, without consequences. Just work in a little additional "liquid" fat like softened coconut oil and some full fat coconut cream. It will still hold together and bake up well even without eggs. It also works well as a "breaded" coating for things like chicken tenders or vegetables. Almond flour does not need xanthan gum to help it hold together, so people that are sensitive to this product may find adding some almond flour to their baked goods may work as an alternative. Once you get started, you'll find that baking with almond flour really isn't all that different than baking with regular flour. Follow some of these tips to help make your baking a success. Measure your almond flour by scooping and leveling, rather than pouring. The way it settles can make a big difference in the amount you actually add to your recipe. Avoid high temperatures. Almond flour baked goods have a tendency to burn easily as they cook very quickly. Use low temperatures and check on them starting a few minutes before the recipe says they will be done. Keep a light hand with risers. Baking soda and baking powder will provide you with a lighter product, but a little goes a very long way with almond flour baked goods. Use parchment paper whenever possible. Almond flour baked goods stick easily. Silicone baking cups and parchment paper help prevent this from happening. If the flour you are using is too coarse and resulting in a heavy "crumb," pulse it through the food processor or run small batches through a coffee grinder until it gets lighter in texture. Elana's Pantry: Elana's Pantry is filled with almond flour recipes, and includes a cookbook of nothing but almond flour desserts. The Urban Poser: This site is filled with almond flour recipes that are also dairy and egg free. The Minimalist Baker: This is not a gluten-free site, but it does contain many good almond flour recipes. Converting to almond flour can take some time to get right, but once you do, the sweet, nutty taste and texture that almond flour brings will quickly become your new favorite. Give almond flour a try the next time you start baking and taste the difference it brings.